As the TV Series ‘800 words’ finished their third series last week, I realized that George, one of the main characters in the programme, keeps his blogs to 800 words. My challenge today and in future blogs is to try and keep it short. I think I might soon get too busy to spend lots of time writing, editing and finding photos for blogs. Having said that, I really enjoy blogging, and as I look back over the past 10 months I can see we have come a long way, and our future has become a lot more defined. Blogging is one way of recording the past year. I am so thankful to those of you who comment, or like what I post on Facebook. Some of you are simply very encouraging with your lovely words, so today I want to thank you for your support. In the next couple of weeks it’s quite possible that my blogs will take a back seat as there are some other fairly important things going on. My intention is to post regular photos and updates; they just might be less than 800 words from now on! 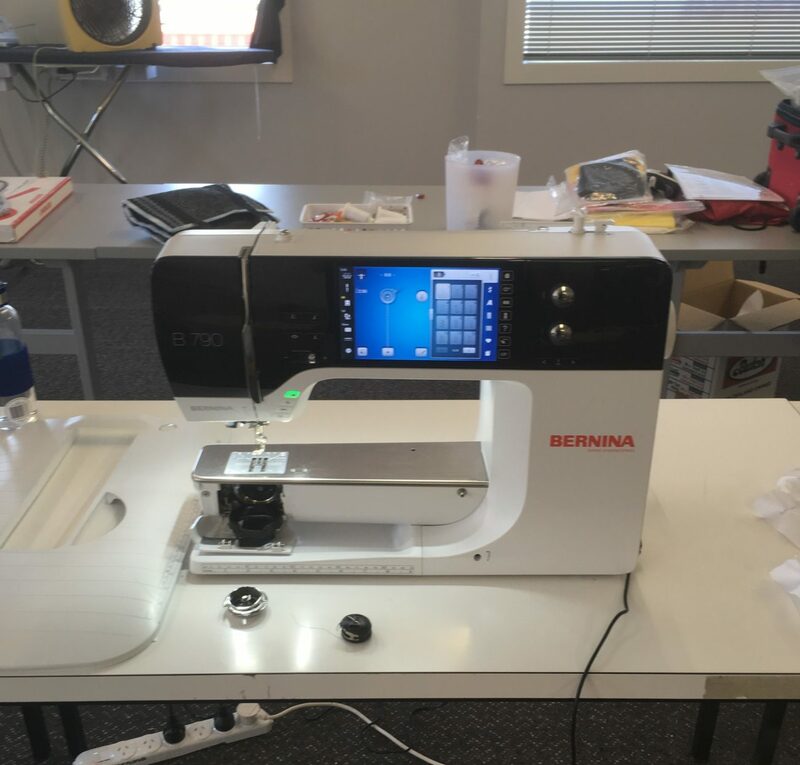 This week we are in Lower Hutt training with the lovely team at Bernina. We have learned so much about so many different sewing machines, overlockers and quilting machines. Bernina have a small team of very dedicated staff, and we feel like we have become a part of their family. Most of our training has been with the gorgeous Julie; what a wealth of information and experience she carries! I am so inspired and challenged by everything she does. The boy has spent a bit of time downstairs in the workshop learning about the technical and mechanical side of sewing machines. It’s all very interesting and we are both finding the technology quite fascinating. Needless to say, I am looking forward to taking some machines home and having a little play by myself before being confident enough to sell a new machine to a customer. We have decided to hold off all demos until everyone is back from holiday, as we have quite enough to do in the next few days without adding the extra stress of selling machines that we are still getting to know. We know we need a support crew that we can call on for help if we get unstuck. We head home in the weekend and over the next few days we will be busy putting up shelves, and sorting out where everything will go in the shop. I am expecting plenty of deliveries to arrive, and of course once we have products in store, they need to be checked off, added to our inventory, priced, barcoded and put on display, both on the online shop, and in our physical shop. It all sounds a bit daunting! And of course everything needs to be paid for. It’s all very well ordering beautiful fabrics and stock, but everything that arrives in store comes with an invoice too! We have had a builder and painter in store this week tidying up some walls and making our countertop. I can’t wait to get back home to see the difference. The building that was a shell when we first looked at it, will fill up very quickly with furniture and stock to sell. The signage goes up at the end of next week. That’s when it will no longer be a secret that ‘The Eye Of A Needle’ is coming to town. We are so excited. We are ready for the challenge. We intend to take things quietly to start with, but realize that it could get very busy, knowing what the Taupo holiday makers are like. I’ve signed up for Nadia Lim’s ‘My Food Bag’ in anticipation of a few late nights in the next few weeks, but there is still a need for good wholesome food to keep us going. I visited your store yesterday and yes made some fabric purchases…. It is good to see a patchwork shop in Taupo, I am sure you will get a lot of support from the locals as well as those traveling through. All the best for your endeavours.